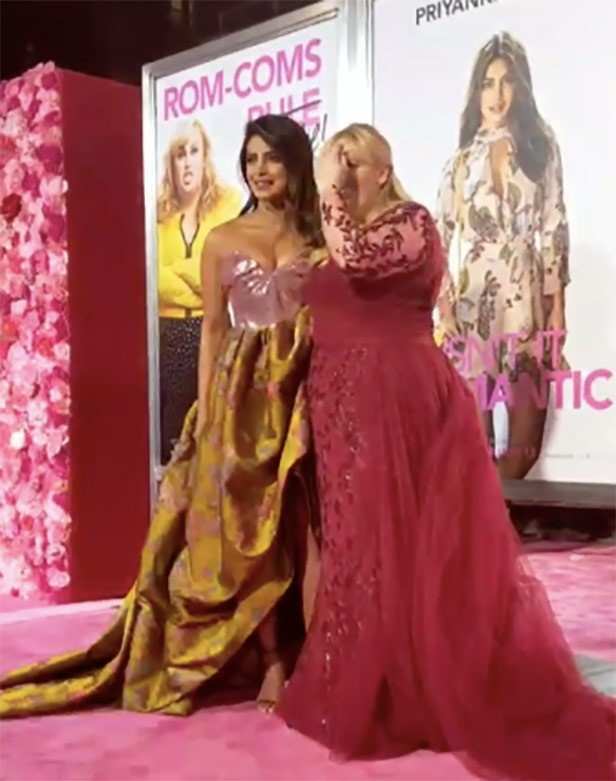 Priyanka Chopra and Nick Jonas attended the world premiere of the actress’ upcoming Hollywood film Isn’t it Romantic in Los Angeles. The film stars Rebel Wilson, Liam Hemsworth, Adam DeVine and Priyanka Chopra. It is the story of a girl, played by Rebel, who after an accident and a head injury starts to see life being played around as a romantic comedy. Liam and Adam play her two love interests, while Priyanka plays a yoga ambassador. The full cast was seen all dressed up and glamorous at the red carpet of the premiere of the film in Los Angeles. Accompanying wifey Priyanka at the special event was the adorable Nick Jonas, who posed with her at the red carpet. Check out the pictures of the beautiful cast below.